The congenital rubella infection can have cardiovascular, ocular and a wide range of systemic manifestations along with cutaneous involvement in the form of thrombocytopenic purpura, maculopapular rash, and less frequently blueberry muffin lesion. We report a case of a preterm newborn with microcephaly, hepatosplenomegaly along with violaceous lesions all over the body. 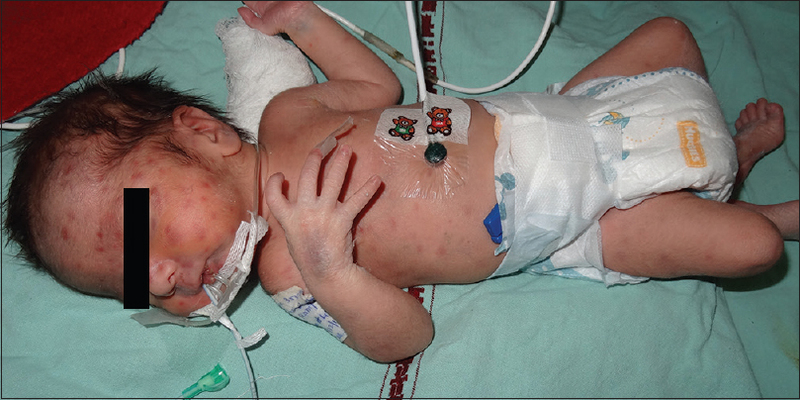 Dermatological opinion was sought by neonatal care unit for a preterm male newborn with a generalized violaceous skin rash. The baby was delivered at 35 weeks of gestation after an emergency caesarian section performed for premature rupture of membranes. There were no significant antenatal complaints in the mother. On examination, the neonate was tachypnoeic but acyanotic and had microcephaly (head circumference 30 cm, less than third centile), and low birth weight (2 kg). Systemic examination revealed hepatosplenomegaly and a pansystolic murmur on auscultation. Ophthalmological examination was normal. On cutaneous examination, there were multiple, discrete, 0.5 Χ 0.5 to 2 Χ 1 cm sized, violaceous macules and barely palpable nodules found predominantly over the face and upper trunk [Figure 1]. Palms, soles and mucosae were spared. Based on cutaneous manifestations, a diagnosis of blueberry muffin baby syndrome was made. Blood investigations showed severe thrombocytopenia (platelet count: 17,000/mm 3 ), raised prothrombin (test: 21.3 s, control: 11.7 s) and activated partial thromboplastin time (test: 180 s, control: 30) with INR of 1.82. Skeletal survey revealed metaphyseal lucencies of long bones and enlarged right atrium [Figure 2]. A small patent ductus arteriosus (PDA) of 2 mm was detected on echocardiography, whereas electrocardiogram was normal. Ultrasonography of the head showed linear echogenic foci, suggestive of calcification in the chordothalamic region. Histopathology from a cutaneous nodule showed several ill-defined nodules of extramedullary hematopoiesis in the dermis, reaching up to subcutis suggestive of blue berry muffin lesions [Figure 3]. Serology of the neonate showed the presence of IgM antibody (42.20 IU/ml) to rubella virus. 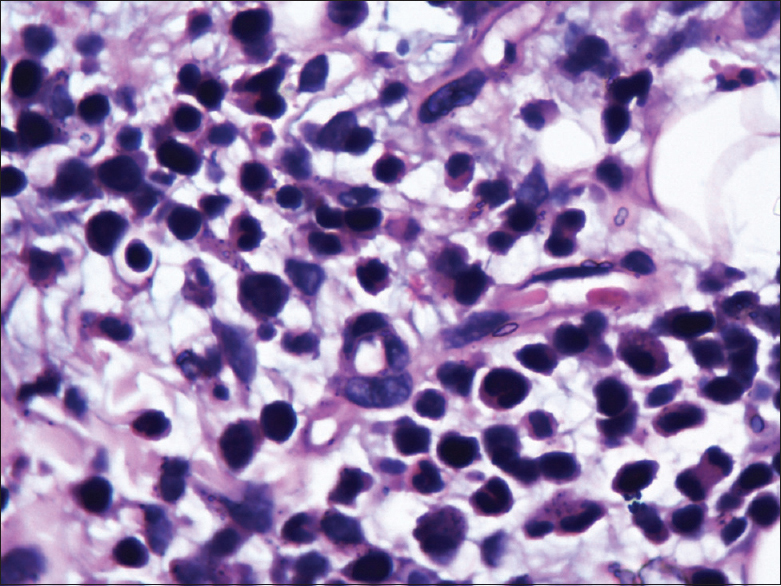 The mother was also found to be positive for Rubella IgM, 79.70 IU/ml, and cytomegalovirus IgG, 209 IU/ml. Rest of the serological tests for TORCH (toxoplasma, cytomegalovirus, herpes virus) and Venereal Disease Research Laboratory (VDRL) were non-reactive in both mother and the neonate. On the basis of the above findings, a final diagnosis of congenital rubella syndrome (CRS) was made. In this era of widespread vaccination, rubella still accounts for a high number of intrauterine infections in the developing countries. In an Indian study, 1-15% of all infants, suspected to have intra-uterine infection, had laboratory evidence of CRS. Spectrum of CRS includes ocular abnormalities (cataracts, retinopathy, microphthalmos, glaucoma), sensorineural deafness, neurological defects (microcephaly, motor defects, mental retardation), cardiovascular abnormalities (PDA, ventricular septal defect, aortic stenosis), genitourinary and bone defects. Cardiac abnormalities occur in 50% of the infants. Our case had PDA which is the most common cardiac defects observed in CRS. 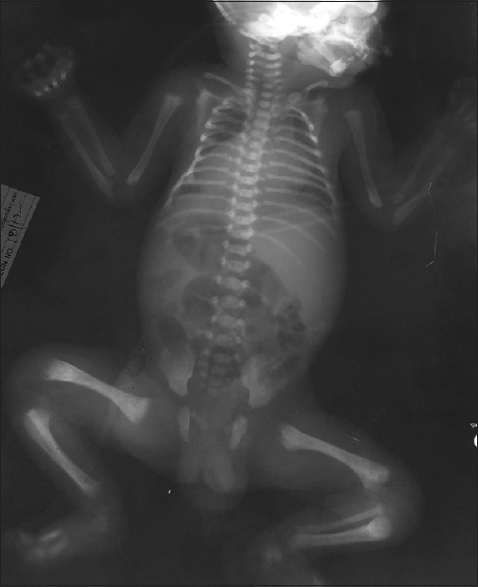 The neonate had bone involvement and hepatosplenomegaly that have been reported only in 10-20% of these cases. The osseous lesions present as transverse radiolucent zones and longitudinal bands of demineralization, which appear because of abnormal mineralization. Rare features of microcephaly and brain calcification  were also observed in our case. We attribute our blue berry muffin syndrome to congenital rubella infection. No specific therapy for congenital rubella has been established, so treatment is primarily supportive. We emphasize the importance of universal rubella immunization especially in females of reproductive age group to prevent the mortality and disability arising out of the congenital rubella infection. Klein HZ, Markarian M. Dermal erythropoiesis in congenital rubella: Description of an infeted newborn who had purpura associated with marked extramedullary erythropoiesis in the skin and elsewhere. Clin Pediatr (Phila) 1969;8:604-7. Way RC. Cardiovascular defects and the rubella syndrome. Can Med Assoc J 1967;97:1329-34. Tan TQ. Giardiasis. In: Feigin RD, Harrison GJ, Cherry DJ, Kaplan SL. Rubella Virus. Textbook of Pediatric Infectious diseases. 6 th ed. Chap 186. Philadelphia: W.B. Saunders; 2009. p. 2271-300. Lindquist JM, Plotkin SA, Shaw L, Gilden RV, Williams ML. Congenital Rubella Syndrome as a Systemic Infection. Studies of Affected Infants Born in Philadelphia, U.S.A. Br Med J 1965;2:1401-6. Argyle JC, Zone JJ. Dermal erythropoiesis in a neonate. Arch Dermatol 1981;117:492-4. Vozza A, Tolone C, Carrano EM, Di Girolamo F, Santinelli R, Ascierto PA, et al. Late onset blueberry muffin syndrome following congenital rubella. J Eur Acad Dermatol Venereol 2003;17:204-5. Rare but characteristic osseous and hepatic involvement is reported in this case.